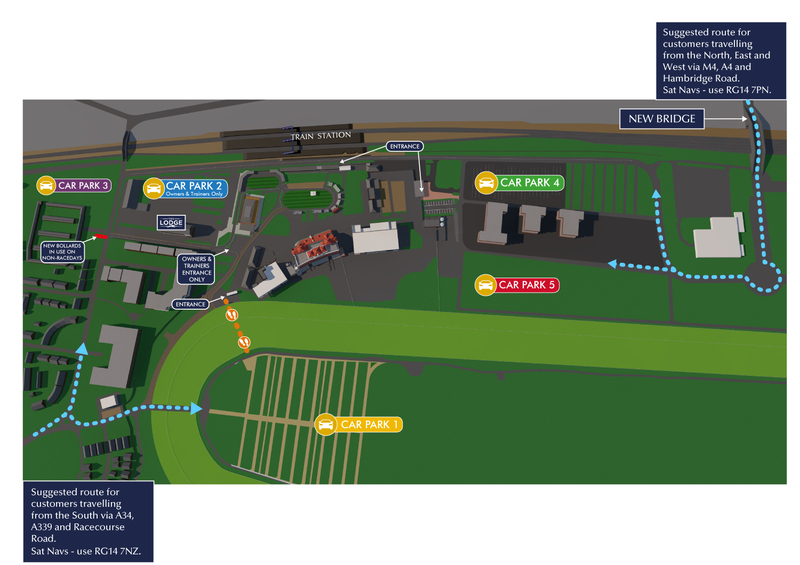 There is plenty of free Car Parking at Newbury Racecourse, please have a look at the map below before deciding where to park. We recommend that if you are attending the Premier Enclosure you should park in Car Park 1, in the centre of the Racecourse and if you are visiting the Grandstand please use Car Park 4. Car Park 1 – Centre of the Course – Premier Enclosure customers, Members, Hospitality customers and Sponsors. Car Park 2 – Owners & Trainers, Jockeys, Officials and Media. Car Park 4 & Car Park 5 – Grandstand & Disabled – Grandstand Enclosure customers Coaches, Limousines and Minibuses – there is an allocated section for Premier Customers & Members who wish to park in this car park. Coach Park – We have ample coach parking available at the eastern end of the site. Please be aware that there is a short walk from the coach park to the main entrance, motorised buggies will be on hand to transport customers. As a busy leisure venue with free parking, traffic can be congested particularly on bigger days. Please see our top tips below to ease your journey and queuing time.